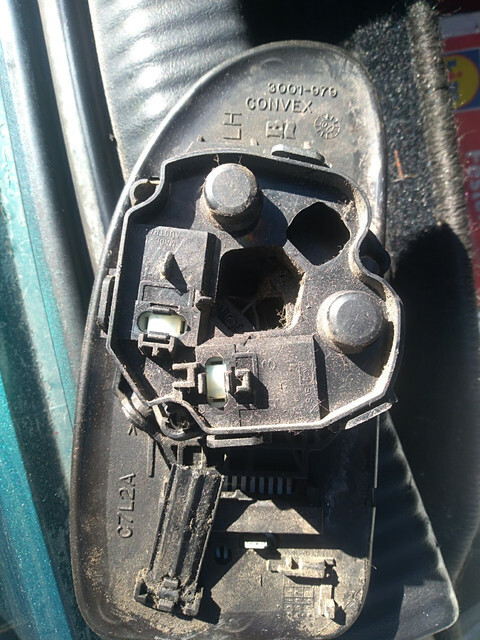 I need to replace the side mirror in my mk1, and there is a motor housing that needs to be removed but it is sitting too tight and was wonderinf if anyone has a tip on how to remove it without damaging the rest. For reasons that I'll omit, I've replaced my mirrors several times. Are you trying to replace just the glass or some part of the assembly? IME, the whole black plastic thing that mounts to the door, available very cheaply on the aftermarket and not pricey as OEM, had to be replaced. I've had no luck attempting to cannibalize units back into a whole. Like mentioned above......replace the whole assembly via 3 nuts the hold the mirror w/ 3 studs, just snug is all you need= don't tweek the studs out via over tightening the nuts. As the the mirror casing has the same colour as the body and replacing the mirror casing will give a nusty look, so I'd rather replace only the glass mirror part, there are many types of it even just a mirror that needs to be glued on the older one, but removing the motor housing part is quite challenging. If you use a junkyard glass with the backing plate still on it the glass simply snaps into place like the other one. Meaning use junkyard glass instead of those stupid glass only replacements with no backing plate. You can pry the glass plate off of one in 5 seconds. The motor is designed like so much other Ford stuff now like door latches and such to DESTROY it removing it, it is essentially one piece with the outer casing to most people. The part snaps in but in such a way to not ever come back out (the snap points are hidden on purpose) without damage and they do it to make you buy the entire mirror unit. amc49, yeah you are right this part is only made for once and it is not made for replacing its parts, but the whole unit. Those who sell these glasses both online and at stores have different types of backing plate but still is difficult to remove the motor housing and set the new glass. I'll find a glass at junkyard and put some glue on the backside of it and place it on the broken one. X2, I've changed them in seconds before. Just to be clear, to be able to replace only the glass you are talking only about the FOLDING TYPE SVT/ST mirrors (which is the 'standard' mirror on UK/Euro Focus) - not the 'fixed (non-folding)' type mirrors most common on 00-07 US Focus, correct? I upgraded the mirrors on both my 02 wagon and 05 ZX4 from power non-heated to power heated and have my old non-heated mirrors off the car. There is no way that I can see for the mirror glass to come off without breaking it or the motor assembly. Correct the svt/st folding mirrors.......+ thats the only way you can remove the body painted mirror caps is to remove the mirror glass.